Yes that’s right folks, Tour de Fat is less than two short months away and we need YOUR help as a volunteer! Thousands of bicycle loving folk will begin arriving to Tempe Beach Park around 9am to celebrate the highest form of transportation known to man, the mighty bicycle! Help us make 2009’s Tempe Tour de Fat the most successful one yet! New Belgium donates all profits to local groups such as Tempe Bicycle Action Group and The Mountain Bike Association of Arizona. In exchange for your time you shall receive not only good karma, but a beer token and a Tour de Fat t-shirt. Available shifts are listed below and are first come / first served. To reserve your spot please find the contact information listed below. TBAG and New Belgium thanks you! 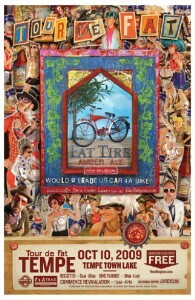 To sign up to be a volunteer for Tour de Fat please send an email to: tourdefat@biketempe.org. When sending us an email, please be sure to include the shift, your name, phone number, T-shirt size (and Mens or Womens cut), your TIPS # if you attended TIPS training in the past (good for 3 years) as well as previous Tour de Fat volunteer experience (example: Beer Booth 2008). You may work multiple shifts if desired.